I have met grown men - secure, strong, worldly men who are absolutely terrified of cities, particularly New York City. To city lovers like myself, these fears seem completely irrational. I understand the fear perhaps of an older person or single woman walking in a dangerous neighborhood at night - this is courting trouble. But a grown person in a vehicle in broad daylight with an entire family in tow? What can really happen? If you get lost, you will eventually get unlost. In my experience, the worst that will happen is that you will be very inconvenienced for some time. The worst scenario to me is breaking down in an automobile in the city. Fixing a flat or getting a battery boost, simple acts elsewhere, can be a real headache here. Services are not readily available and waiting for roadside service on a busy highway in a traffic congested city is certainly not pleasant. And if one would have to overnight in a hotel, that would be mighty expensive or very inconvenient. 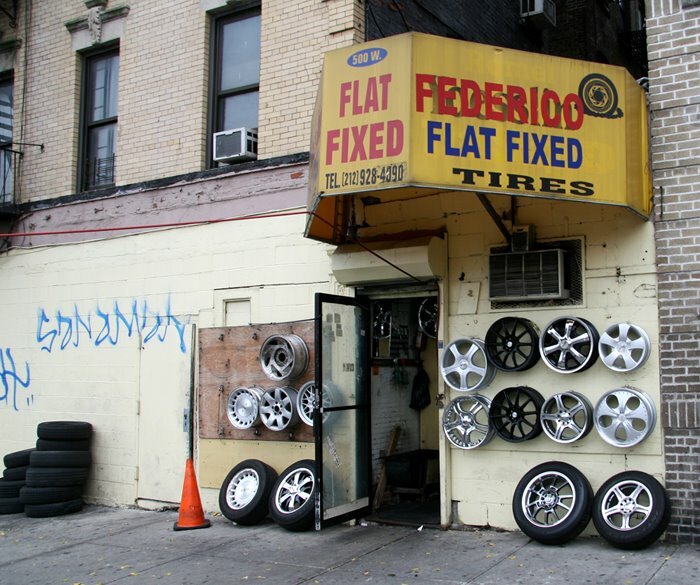 There is no plethora of basic services like tire repair - places like that in the photo are generally found in poorer neighborhoods and in out of the way locations. Unless you know a neighborhood well, these places are destinations - the likelihood of finding them when you need them is rather remote. And escalating rents have conspired to make these places all but non-existent. The scarcity has made this type of subject a popular photo.